This entry was posted in Comments about Cycling on May 10, 2015 by Steve Tilford. I’ve been down in Austin the last few days trying to avoid the rain that seems to have overtaken the whole midwest. And I didn’t do a very good job of the avoidance. I haven’t actually gotten caught in much rain here, but it is impossible to avoid the heat and humidity, which, the latter, is caused by rain. It really hasn’t been that hot, in the mid 80’s, but it seems crazy hot when it is close to 100% humidity. At least I’m not out in Colorado with Vincent. It is snowing right now in Arvada. The rain here is badly needed. I rode by Lake Travis yesterday and there is actually some water in it. I’m not sure it will ever be full again at this rate. I heard it rained something like 8 inches here and if that is all the water that stays in Lake Travis, then it is worrisome. My friend Ann, who I stay with down here, has had a bunch of big life changes. She got married a few months ago and now is buying a new house. We went by the new house to check out some of the construction they are doing before moving in. It is really close to her old house, but in a much quieter neighborhood, on a cul-de-sac. I like seeing construction in progress, so it was super fun. We went out to dinner at one of our regular places, Z’Tejas, which was nice. My Garmin computer has been acting up recently. It seems to go dead, for no reason. Someone told me I can send it back and get it overhauled, but I hate not having it. It seems to work sometimes and then not again. I should read up about it. Maybe it needs an update or something? I’m heading back to Kansas soon. It looks like the rain there is going to be gone after today. I need to finish painting a house there. I have it mostly scraped and sanded. I’m not one to do a mediocre job on something, but I’m not too into this project, so I’ve lowered my standards some. Okay, I’d better head back out into the humidity. 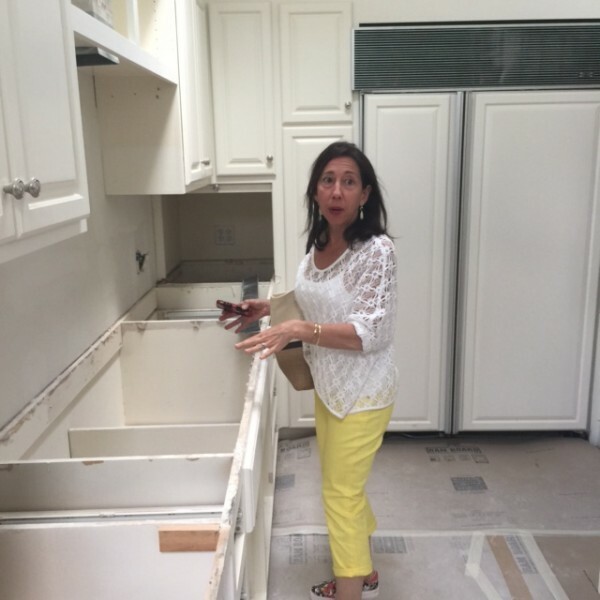 Ann showing me the kitchen in their new house. Well not much after your comment regarding lake travis and “not sure it will ever get full again”…it’s gone up close to 30ft in the last couple of weeks!